Next week we begin our trip to the Scandinavian countries of Sweden, Norway and Finland. I have not yet started to pack clothing and necessary items-like my toothbrush- but my sketching materials are ready! I have started to prep some pages in my sketchbook and prepping my thinking to make sketching a priority habit on this trip. When traveling, sketching seems as though it should be easy and quick and it is not. Often, I will forgo sketching because of the travel schedule time element and/or my travel companion is not a sketcher and wants to “move on” to the the next site. Time for sketching can not be completed at a leisurely pace. To prepare for this inevitable situation I have developed a list of potential times to sketch that might provide more leisurely time using my sketchbook. 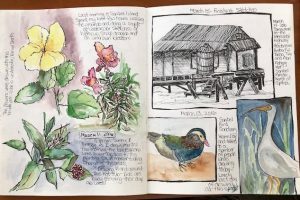 My list includes sketching while waiting at airports, sketching while we are traveling by railroad, capturing the landscape from the deck of a cruise ship, sketching at a restaurant while waiting for a meal. We will be in museums where I can draw and in small towns for easy walking at the end of the day for nature journaling. When a tour group stops for photographs I can open up my sketchbook rather than setting a shutter speed. I have written these strategies into my sketchbook as a reminder. Using my cell phone camera is another tool. I can start a sketch and when it is time to go, photograph what I am drawing for reference. The drawing can be finished back at the hotel in the evening. Drawing is meditative and at the end of a busy day drawing might be the perfect way to end. Though drawing is primarily a visual exercise, flexing other sensory muscles can deepen my engagement. What did I smell? What did I hear and which sounds stood out the most? With each observation, I like to note it on my sketch. These annotations will help create evocative memories of the wonderful places experienced with travel. Sketching is well worth the effort. Besides pre-thinking how and where I can draw on this trip I have also prepped one page in my sketchbook to be calendar. I can draw one simple image to remember any given day. I found a wonderful template that could be used in so many ways. 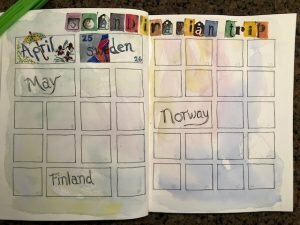 I used this to create a calendar for the time that we will be away and also left the right amount of boxes for the days we will be in each country. I added a title, some color wash as a background to neutralize the white of the page. I now have a place in my sketchbook devoted to drawing one thing that catches my attention. I am looking forward to seeing this page completed. Sketching does more than help me remember places—it opens doors and creates connections. I could write all day in my journal and no one would stop to watch or ask me what I was doing. It’s different when I have my sketchbook. There’s just something about art that encourages people to approach you, to peer over your shoulder, to look up at the subject you’re sketching and then back at your drawing to compare likenesses. Also, when I sketch while traveling, I have much more vivid memories of places when I look back on my sketches. My goals for using my sketchbook require DESIRE and PERSEVERANCE. With pre-planning and attention to the trip’s schedule and awareness for possible detours in my thinking I believe that I can end up with pages of memories. 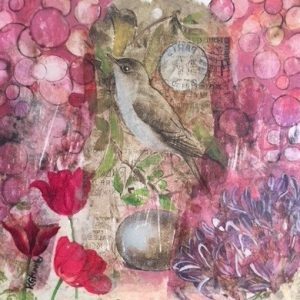 Recently I stumbled onto the world of image transfers (putting photos or artwork on wood, canvas, tiles, fabric). 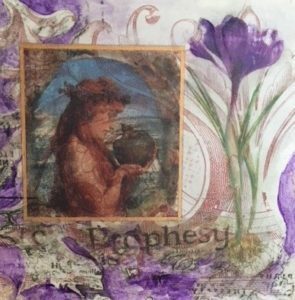 I attended a workshop last week and since then I have been playing with this technique to transfer images on artist panels. I am addicted to the process. Combing through old photos, printing images on the jet ink printer, and digging in my box of collage papers has produced treasures that have been fun to manipulate. The class was taught by Bryan Holland, an artist from St. Peter Minnesota. Bryan walked us through the process using a mixture of gel mediums. 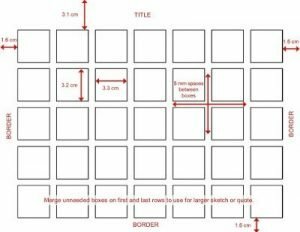 Image transfer can be a touchy process and takes a bit of practice to develop a sense of timing for setting the image and then patience for removing the residual paper backing. 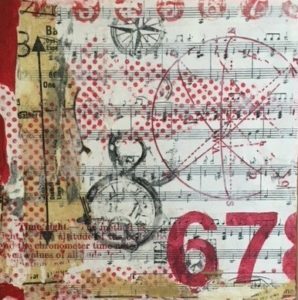 As an artist who has always been fascinated by collage because of the unusual juxtaposition of paper and images, image transfer offers another process for building layers. I never know what will happen as the image is transferred.With each addition of an image another dimension to the composition is added. With each failure of an image to transfer adds another conundrum. 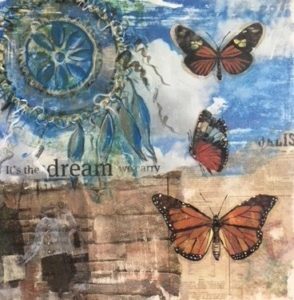 For this week’s blog I leave with you four of the collages using image transfer I created. I had a lot of studio time this week! 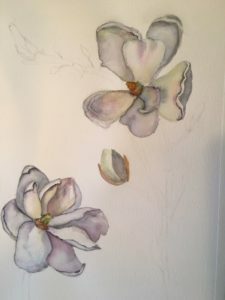 My next step is to combine watercolor with this process. The possibilities are endless. Georgia provided us the opportunity to limit a painting to three colors. In my case that meant ignoring 21 other colors on my palette for three basic colors- red, yellow, blue! In teaching color theory to K-12th graders for 30+ years these three colors would be primary colors. The term “primary colors” refers to a collection of three colors that can be combined to form a range of additional colors. In reality, you can pretty much pick any three colors and call them “primary” colors. Mixing two of your primary colors together will result in a secondary color; mixing one of your primary colors with one of your secondary colors will result in a tertiary color, and so forth. Mix all the primary colors together and you will mix a neutral gray. I used Daniel Smith’s Permanent Rose (red), Aureolin (yellow) and Thalo (blue). I said farewell to my other 21 colors. 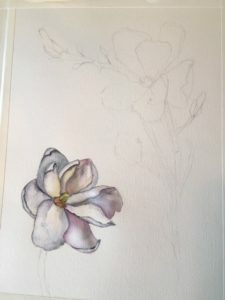 The painting began with sketching out a magnolia blossom in three different stages. 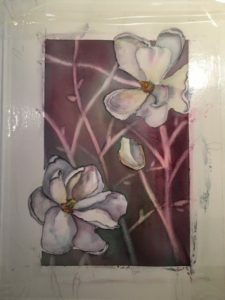 The painting progressed with just painting the blossoms. Each petal was painted with clear water and then a diluted version of each primary color was dropped into the petal’s puddle of water. By tilting my backing board, the primaries mixed to a point that seemed reasonable. As each petal dried I by added more primary or mixed primary color for shadows and contrast. The next stage was to paint the background. Before doing so, I used clear packing tape and created the boundary where I wanted the background. I was careful not to get any “puckers” in the edge of the tape. 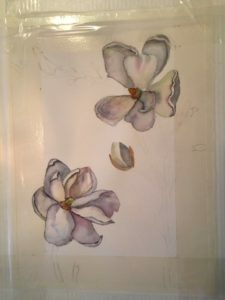 I was surprised that the packing tape did not effect the fibers of the paper or my painted blossoms when I later removed it. Again, I carefully painted around the blossoms with clear water. Dropping the three primaries into the wet background and tipping and tilting the board allowed the colors to run and mix together. Where the paper was left dry the color would not run so my blossoms were safe. 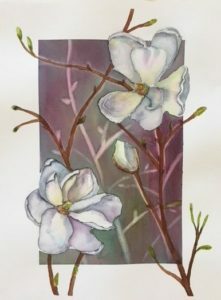 With my brush, I lifted branches and buds out of the semi-wet paper. The last stage was to remove the tape and extend some of the branches out from the background and highlight some of the branches that I had lifted color out with my brush. The finished watercolor can be matted or left as is for framing! Did I miss all 24 of my watercolor colors? Perhaps, but once I got into using a limited palette I rediscovered that a limited palette helps with: 1. creating a greater balance throughout the painting, 2. creating a color harmony that is easier to achieve, 3. having a less chance for over mixing, 4. making it faster to paint, and forcing me to think about tone and composition. In short, a limited palette is more efficient. If you use just three or four colors on your palette and use them consistently, you gain more control over your color mixing. It simplifies the thought process. Monet loved to use a limited palette to paint some of his amazing outdoor impressionistic work. He achieved more luminescence by having to utilize more mixes rather than from a variety of colors. He used just three colors, a warm and cool of each. So, I am convinced to try other cool and warm primary triads and see what I can achieve! I have been “cleaning out”-a spring habit passed down to me from my mom who probably had it passed down from her mom. It is not such fun work until you see what has been accomplished and/or you stumble across things you had forgotten you had. My cleaning binge was thwarted by a book I came across in my shelves called Learning by Heart: teachings to free the creative spirit. 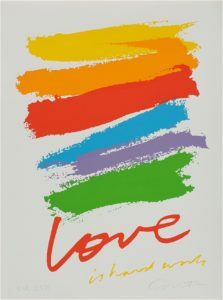 The book was written by Sister Corita Kent and Jan Stewart. Kent was a nun, an influential pop artist, and a charismatic professor at a small Catholic liberal arts college, Immaculate Heart in downtown Los Angeles from 1947 until 1968. She believed that everyone was an artist, “We can all talk, we can all write, and if the blocks are removed, we can all draw and paint and make things.” Stewart was a student of Kent. I had to stop my cleaning out and read. I must have purchased this book shortly after graduating from college. The serigraphs that Sister Kent created are so reminiscent of the late 60’s and early 70’s. You could walk into any printmaking studio of this era and find a familiarity with color, theme, composition between Kent’s work and student work. I found myself having a flashback to the 60’s and 70’s. Learning by Heart: teachings to free the creative spirit is a gem of a book for getting back to looking, seeing thru a child’s eye, creating simple tools for seeing the world, and looking at the everyday for sparking creativity. Each chapter has a number of exercises, based on the curriculum that Sister Kent used in her classes at Immaculate Heart. Be self disciplined. This means finding someone wise or smart and choosing to follow them. To be disciplined is to follow in a good way. To be self-disciplined is to follow in a better way. The book has left a dusty shelf and has now joined on my bedside reading collection. I forgot all the interesting advice for seeing and creating Kent wrote about in this book. I am hoping to rework through some of the exercises in this book and I will let you know how it goes!